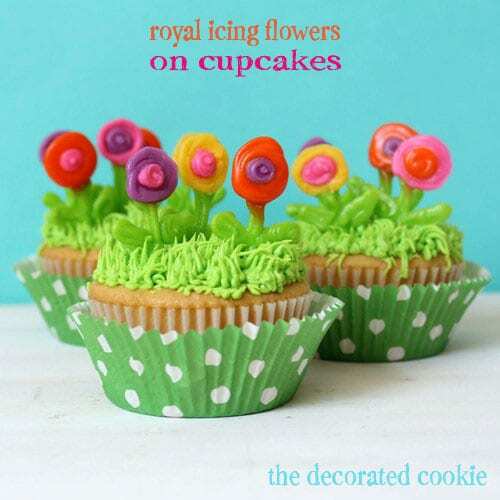 How to decorate fun spring cupcakes with royal icing flowers. 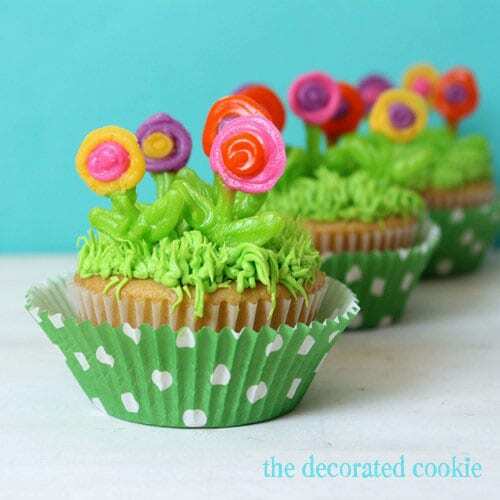 These spring cupcakes with royal icing flowers are another one of those “whipped up with leftover icing” things. I’m not crazy about my piped designs, for which I blame my kids. Ugh, they always need stuff like dinner and formula. Point being, I really did whip these up. Too quickly. 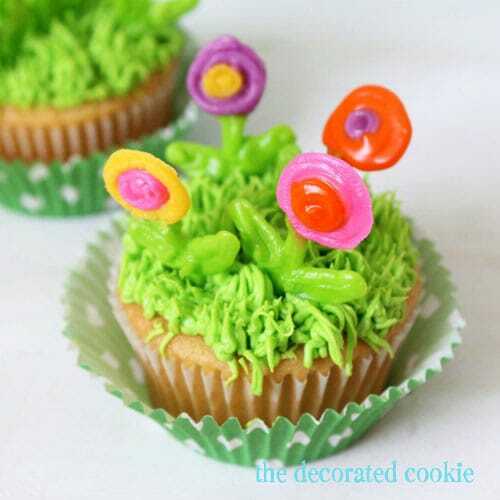 I may revisit the flower thing the next time I have leftover icing. But the beauty is, you can make your own, way better flowers. 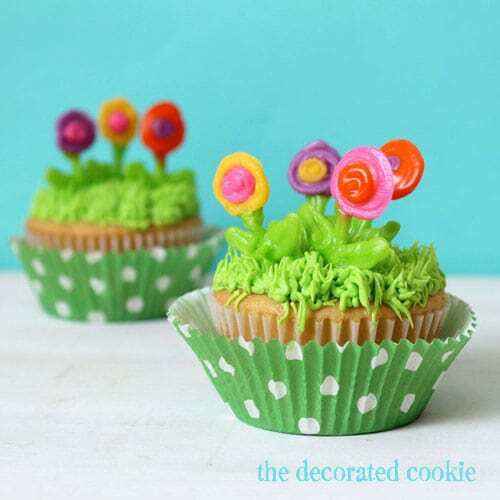 But for concept’s sake, spring cupcakes! *Find the decorating bags, couplers and tips in the craft store. You’ll need one of each for each color you choose. For food coloring, I suggest Americolor Soft Gel Pastes (Electric Green, Electric Pink, Electric Purple, Egg Yellow and Orange used here). step one: prepare your icing according to the recipe. Divide and tint your preferred colors. Prepare decorating bags with couplers and tips, fill with your colors and close tightly with rubber bands. step two: pipe your designs. Line a baking tray with wax paper. Pipe small flowers, 1 to 2 inches tall. Let the icing dry very well, overnight. step three: top your cupcakes. 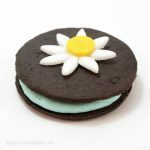 Carefully pull the flower off of the wax paper and gently insert into the cupcakes right after they are frosetd (see below). step one: make your cupcakes and frosting. Prepare cupcakes and frosting. If you’re using store-bought frosting, you may need to thicken it with powdered sugar so it holds its shape. Tint green (I used Americolor’s Electric Green). 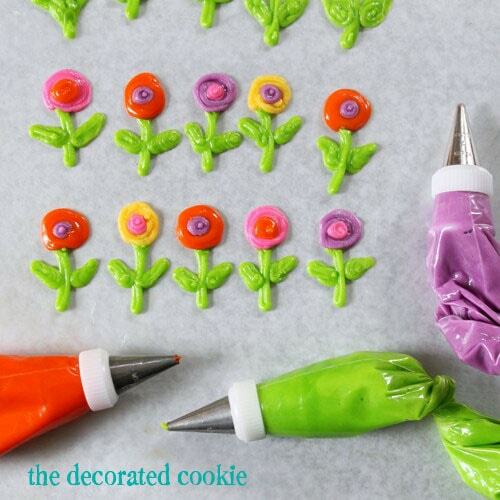 Prepare the decorating bag with the tip, fill with frosting and close with a rubber band. step two: frost your cupcakes. 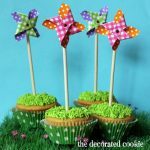 Holding the decorating bag vertically over the cupcake, squeeze and pull up while squeezing. Repeat to cover the cupcake. Immediately insert the flower toppers. oh, that is cute. 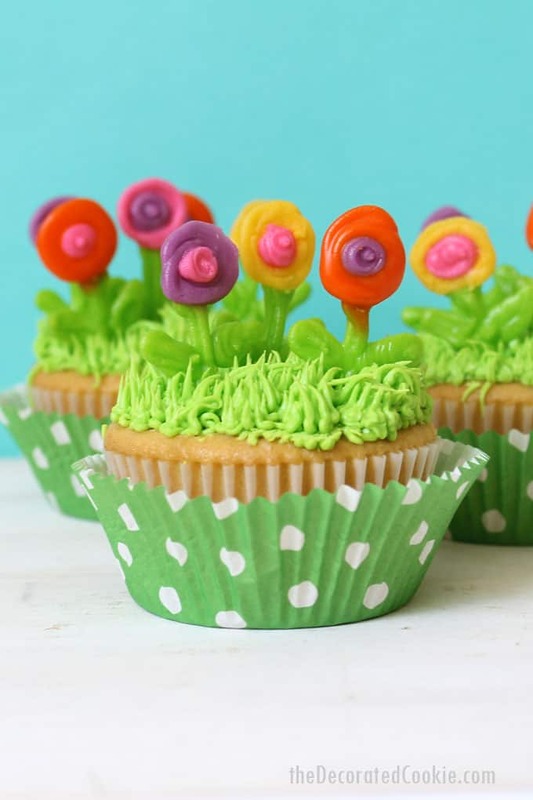 we have a fairy/rainbow party for my almost 4yr old this weekend…am pondering how i could use this concept….hmmmmm…..
How bright and Spring-ish. Love these. Good work as always. yea you have been doing simple stuff lately (I’m not blaming u for it) idk I just like to do really detailed things when I’m baking! You HAVE to know I adore this. So tiny, cheery and cute! What a great idea! 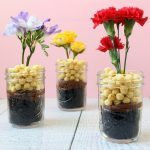 I just made royal icing drop flowers for cupcakes… but I love this idea too!! Great job! Hii! I love your work! I just have one question, is there any difference in making royal icing with egg whites in case I can’t find meringue powder? Meringue powder could not be substituted with cream of tartar right? I understand meringue powder is powdered whites and cream of tartar is just used to stiffen icing…Thank you so much for your help! The benefits of meringue powder are 1. safety, as raw eggs can carry salmonella, though that is rare for eggs. 2. consistency. I find the dried egg whites just produce a better royal icing. However, if you can’t find meringue powder, than egg whites work just fine! The cream of tartar is just a stabilizer, so that shouldn’t affect consistency, and that would NOT be a substitute for meringue powder. Hope this helps!